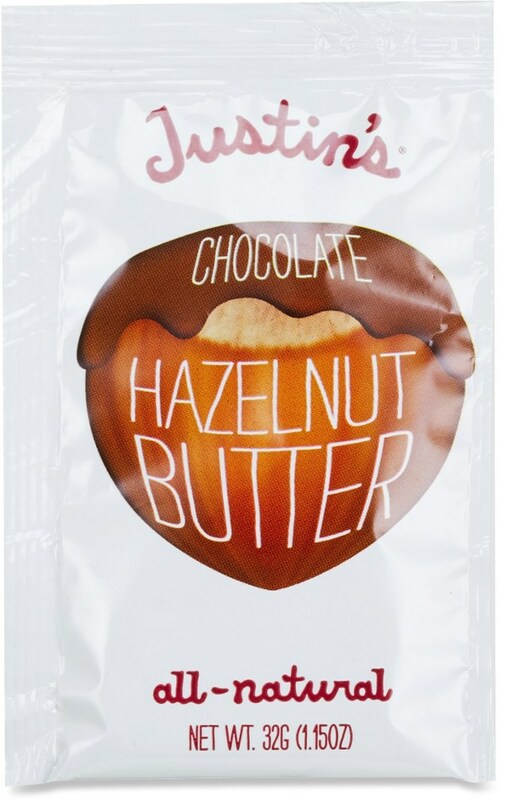 The Trailfoody subscription services provides a monthly mailing of a variety of healthy, minimally process snacks. 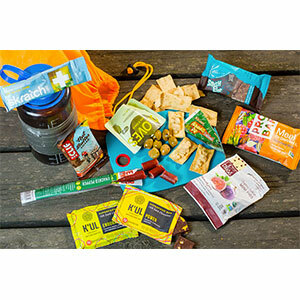 Trailfoody is a subscription service that provides a variety of healthy, flavorful snacks to fuel outdoor recreation whether it’s hiking, skiing, paddling, fishing, or other fun. It’s like a Christmas stocking full of treats every couple of weeks. There are different subscription levels that dictate the time interval between deliveries. 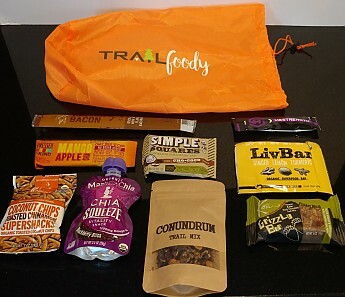 I got to sample Trailfoody treats that arrived in a compact cardboard box with the Trailfoody sicker on the side. 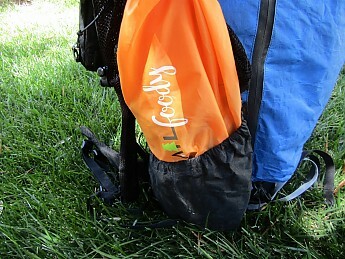 The first thing I noticed was a bright, orange bag emblazoned with the Trailfoody logo. I grabbed it and knew immediately that I had found a replacement for my old, boring lunch sack. When I’m backpacking I usually have to carry a bear canister in the Sierra so I like to keep my day’s lunch in a sack that will fit in an outside pocket so I don’t have to deal with the canister during the day. The bright, happy color of the orange bag contrasted nicely with my blue pack. Now, some backpackers wouldn’t even notice how colors go together but it’s the little things that bring a smile to my face. 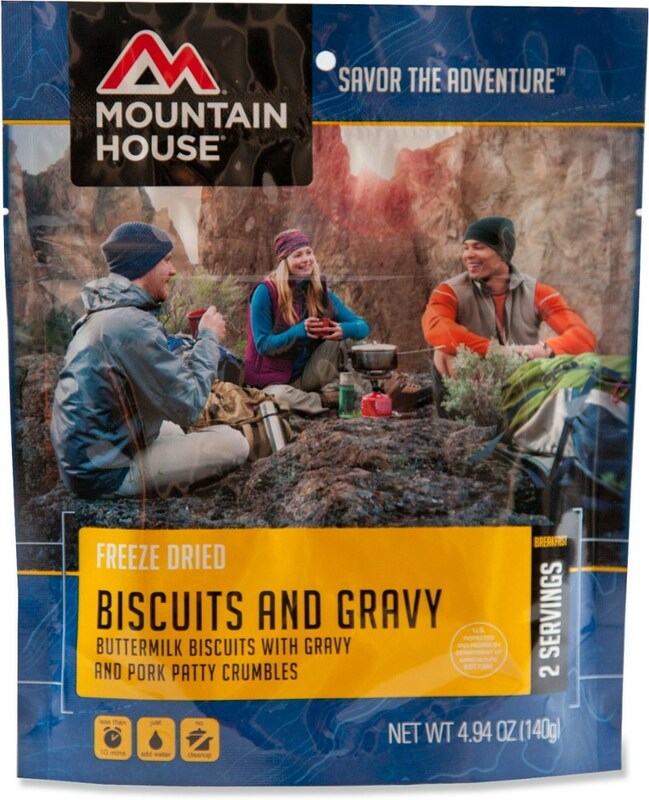 I received the box in early spring, just ahead of the first of eight backpacking trips. That’s a lot of food to organize! I make a lot of my own food and often run out of time and energy by the time I get to the snacks. It was really nice to be able to reach for interesting new foods, a few for each of the early trips. Now that I have completed six trips I’ve had enough time to taste everything and I can report that there was nothing I wouldn’t try again. First was Mestrength energy drink powder. Grape wouldn’t normally be a flavor I’d choose but this was light and refreshing without being cloyingly sweet or too salty. 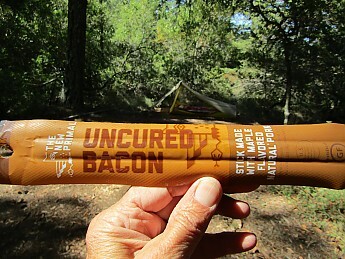 I almost couldn’t wait until I got into the backcountry to try The New Primal Uncured Bacon Stick and it was everything one could hope for in a pork product. That one will definitely be on my list for my 150-mile backpacking trip on the Pacific Crest Trail later this summer. There were a few different bars that offered unique flavors. The most unusual was the Ginger Lemon Turmeric LivBar, packed with all kinds of seeds, quinoa, brown rice and coconut. The texture was crunchy and while the turmeric was relatively subdued, I’d want this one to be more of an occasional treat. The Kind Mango Apple Chia bar, with just fruit and chia, was dense but tasty with a healthy dose of fiber. The Simple Squares Chocolate Coconut bar with nuts and honey also had a crunchy texture and balanced flavor. The Peanut Butter, Dark Chocolate Trail Mix Grizzly Bar was called a pocket meal for good reason—it lacked the crunch of some of the other bars but packed 360 calories in a small square. 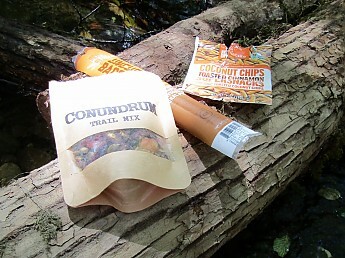 A couple of items were trail mixes. The Made in Nature brand coconut chips had a dusting of toasted cinnamon that set it apart from traditional trail mixes while the Conundrum Trail Mix was more typical with a variety of dried fruits and nuts. Perhaps the most distinctive snack was the Mamma Chia Blackberry Bliss Chia Squeeze, which was a little like a lumpy smoothie. 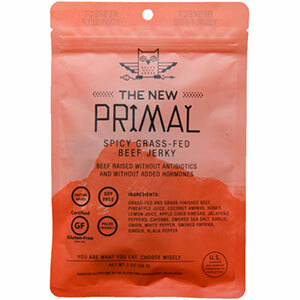 I liked the berry flavor and it was consumed quickly with the squeeze pouch. Chia seeds being what they are, I was picking them out from between my teeth for a couple of hours following my snack. The Wanderer, the lowest Trailfoody subscription level, provides a monthly package of foods that should sustain one or two outings for one person with around nine items. There are four levels with the highest level being the Family subscription, which offers enough foods for two adults and one child with around seven items per person. Additional kid packs, which contain food especially for the little ones, can be ordered. 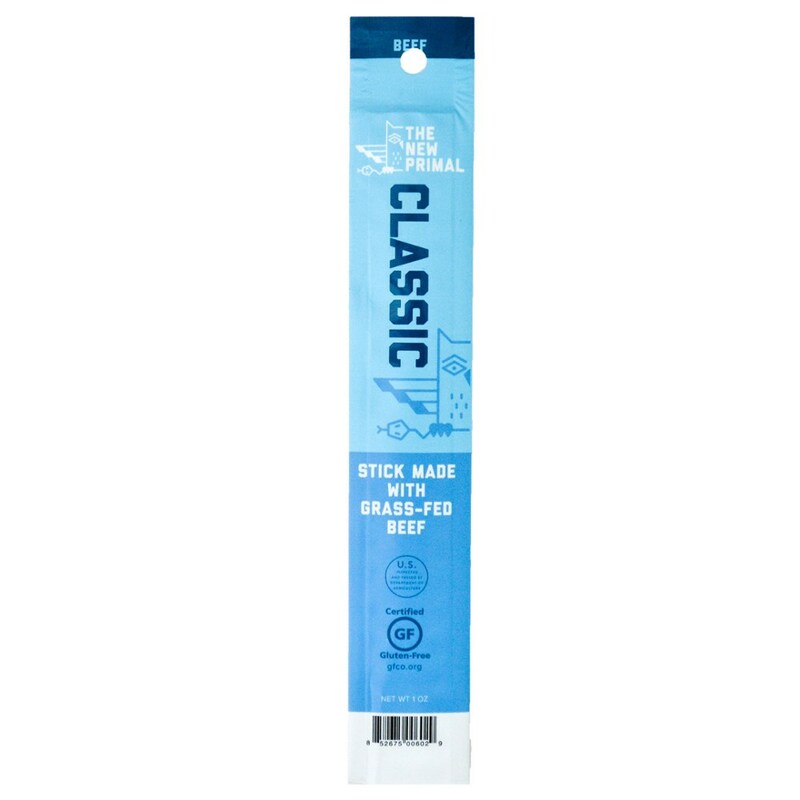 Each kit is different so one of the main benefits is being able to try lots of different brands that you probably didn’t know existed. Many hikers complain about hating their energy bars after a while, so having a lot of variety is a good way to avoid burnout. I like this line from Trailfoody: “Xenofakofoodio doesn’t sound very appetizing.” They source healthy options from boutique, and up and coming brands. 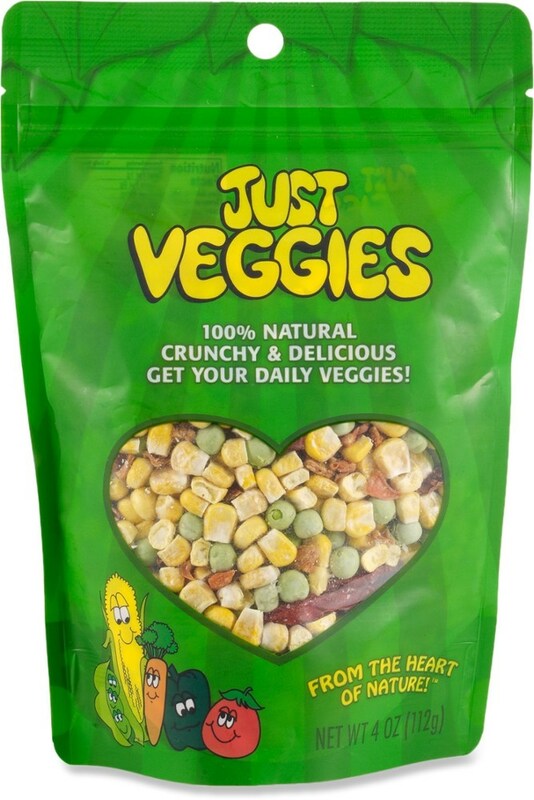 They eschew ingredients such as GMO products, corn syrup and artificial ingredients whenever possible in favor of real foods that include grass-feed beef, buffalo, fruits, nuts and organic foods. The lowest price of 19.95 for the Wanderer came in just under what the cost would have been to purchase the items individually, so it's a decent deal. As with all subscriptions, they may lose their luster after a period of time, depending on how much you like the products and how much variety there is, but that's an individual preference. It was a lot of fun to try all the snacks in the box and the contents of one delivery was more than enough for several trips. 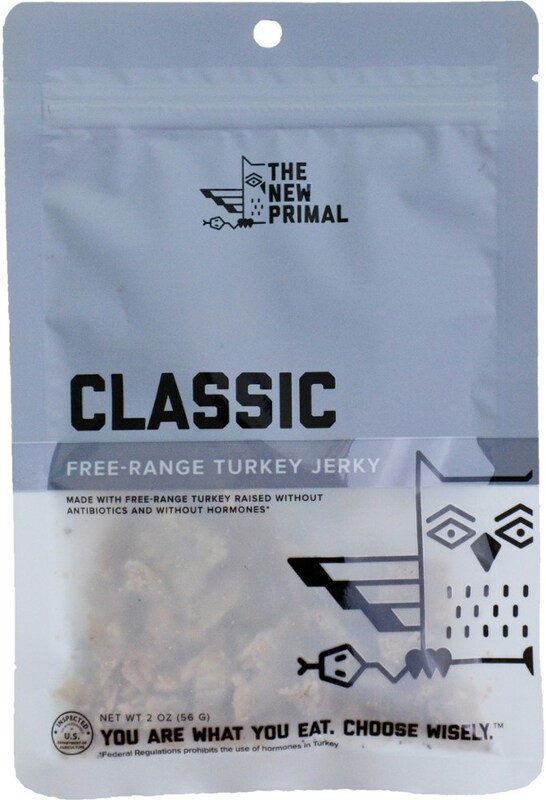 I have some new favorites, include the New Primal Uncured Bacon Stick, and I love my new lunch sack. The Trailfoody The Wanderer is not available from the stores we monitor.